A social worker fired after Victoria Climbie's murder is at the centre of a High Court battle over whether she should work with children again. 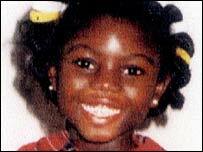 Angella Mairs was sacked for gross misconduct by north London's Haringey Council after Victoria's death in 2000. On Tuesday, lawyers for the education secretary responsible for the original ban, asked a judge to overturn the appeal decision. Ms Mairs was the manager and supervisor of social worker Lisa Arthurworrey, also sacked for gross misconduct after the eight-year-old's death. Philip Coppel, appearing for the education secretary, argued the tribunal failed to make clear findings on critical issues and was at odds with findings of the Laming public inquiry into Victoria's death. He had previously argued before the tribunal that Ms Mairs' failings were so grave she should never be allowed to work with children again. On Tuesday at the High Court, Mr Coppel told Mr Justice Levenson that it should have been apparent to a person in Ms Mairs' position that Victoria was "at real risk" but she failed to identify matters which needed immediate attention. But the 2004 tribunal found Ms Mairs' only misconduct related to her failure to "flick through" the case file, sign her name and press Ms Arthurworrey for further information. Victoria died with 128 scars on her body. Her great-aunt Marie Therese Kouao and her boyfriend Carl Manning were jailed for life in January 2001 for the child's murder.